Allow us to paint a picture for you. It's a warm summer evening, you've flung open all of the windows to get a bit of air circulating around, and you're just about to have you tea when a big ol' fly buzzes in and goes straight for your dinner plate. He seems to have designs on your mashed potatoes; you frantically try to shoo him away but this bug just won't stop bugging you. It's annoying, isnt' it? We should be able to get some fresh air in the summertime without being bothered by flies and wasps and all the other myriad minibeasts who can't help but invite themselves inside. We at Gadget Inspector were sick and tired of little buzzy things in the office, and while we haven't been watching Wimbledon too closely (we prefer badminton), all the recent tennis talk did give us an idea. Introducing the Electronic Bug Zapper! This nifty little gadget could prove to be a huge breakthrough in the war against bugkind; simply give your insect oppressors a swift swat with the zapper, and...well, let's just say that they won't bother you anymore. The bug zappers are just £6.99 each right now, and since they're shaped like tennis racquets, they're very satisfying to brandish. Get yours now, and enjoy your summertime teatimes in peace! Festival Time! Have you got these essentials? All of our hip young friends have forsaken us in favour of the Glastonbury festival this week. It's weird; everyone left on Tuesday, but we've checked online and it seems like there's no actual music until Friday. What are they doing in the meantime -twiddling their thumbs? 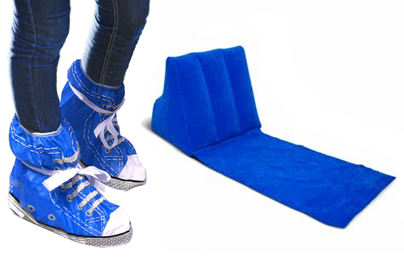 Our Festival Feet are an innovative alternative to wellies. If you'd rather wear your usual, comfortable footwear when you're wandering around the festival site, simply put these protective covers over your shoes and head for the main stage, safe in the knowledge that your favourite shoes aren't getting ruined. It can get pretty boring when you're waiting for the arena to open and the bands to start, so why not invest in a Wicked Wedge to lounge around on while you wait? This inflatable festival accessory is super-comfortable, and it puts you in the perfect position for a bit of light reading. The 21st of June has been and gone, so we can now officially say that it's summertime. And that means long days, summery smells, and plenty of wonderful warm sunshine. Not that anyone here at Gadget Inspector will notice; we're all planning to spend our summers indoors, playing video games. Just like always! So, will you be drawing the curtains and settling in for some spectacular console action this summer? And if so, which games will you be playing? With over 30 years of history to draw upon, there's an almost infinite selection of stuff for the summertime gamer to choose from, and we...what's that? You'll be playing nothing but Call of Duty from now until September? Oh. War games might be all well and good for some people, but the Gadget Inspector office is populated with guys and gals who never really let go of their old games. This is why our gadget website is so chocka with retro gaming paraphernalia; we've got Tetris Lights coming out our ears, but there's not a Master Chief bobble head or a Nathan Drake bottle opener in sight. Perhaps this is something of an oversight on our part - a lot of people have played the Uncharted series, so a range of Nathan Drake gadgets might actually sell pretty well! But our allegiance will always lie with retro games. Modern stuff is very impressive, and they've done very well to make everything look life-like and cinematic, but if we want something like that then we'll go to the pictures, thank you very much. Give us a pixellated wheel of cheese being chased around a labyrinth by four wide-eyed ghost thingies; give us an assortment of falling blocks that disappear when arranged in a certain way; give us simple, instantly playable, not-cinematic-but-still-incredibly-immersive gameplay any day of the week. Man of Steel came out a week ago, and the 7 days that have passed since have been one big Superman stupor for the folks here at Gadget Towers. We've always been pretty big comic book fans, and this new blockbuster gave us a great excuse to let our geekier sides come out to play. "If you could have any superpower at all, which one would you choose and why?" "My superpower would be to make people tell the truth. I'd have great fun making politicians reveal their darkest secrets :D"
"I would have magic hands that cleaned the whole house in minutes :)"
"xray vision...no more dodgy socks for me for xmas"
"read my bosses mind #greatestsuperpower"
"Invisibility! So many possibilities, sneaking backstage at concerts etc!" So that about wraps it up for the cufflink competition, but there's still plenty of Superman-related joy to be discovered here at Gadget Inspector. This Superman Wallet is down from £14.99 to just £7.99 at the moment, which means that we're both saving you money and giving you somewhere to store it. You can never have too many gadgets, and that's why we're always adding new items to our collection! There's always something new to discover, and whether it's a cool new RC toy or just something interesting to decorate your home with, the Gadget Inspector site is the perfect place to discover it! After all, we're just as gadget-geeky as our customers! The Take a Break Mug is pleasantly chunky and bold of colour. It'll make a great home for your hot drinks, and it goes rather well with our Take a Break Tin [no longer available] and the Take a Break Coasters. Talk about your perfect sets - these three items are ideal for those emergency tea and biscuit breaks! If you enjoyed crashing your Micro Drone Quadrocopter into the wall over and over again, you're bound to be equally besotted with the Bladez Remote Control Quadrocopter [no longer available]. This compact wee 'copter is suitable for indoor and outdoor use, and beginners and masters alike will find plenty to love in this brilliant bit of remote control kit. It can do all kinds of cool stunts, and the 2.4GHz frequency means that ten people can fly their quadrocopters at once! Oh, and it's currently on special offer - we're letting it go for a full £28 less than the RRP! Finally, we come to the Katana Bookends, and these might be our new favourite product. You might be surprised to hear that us hard-working gadgeteers have time for any leisurely literary exploits, but the truth is that we love reading...and we love it even more when our books look like they've been skewered on a samurai sword! The magnetic design means that you can conceal the actual bookends inside the cover of your books, leaving either end of the 'sword' as the only exposed parts. It's an astoundingly realistic look, and if you've been searching for a way to make your library even more awesome, your search ends here! Not keen on that haul? Don't worry - we're always adding new products to the Gadget Inspector site, so keep checking back on a regular basis. Who knows what we'll stumble upon next?